Wednesday, May 31, 7:30 p.m. and Thursday, June 1, 7:30 p.m. Available at Piccolo’s Music and at the door. Contact Dr. Michelson following the concert or call him at 459-8259. I – Christus natus est, Hodie! Alleluia! This day a savior appears. Hodie in terra canunt angeli. Laetantur archangeli. Hodie! This day on earth angels are singing. III -Hodie exultant justi, decentes. Gloria in excelsis Deo! Fourté began their musical journey 10 years ago when four members of the Helena Chamber Singers (directed by Dr. Steven Michelson) got together to perform an a cappella quartet piece for the 2004 spring concert. They enjoyed that experience so much that they have been rehearsing and exploring new a cappella music ever since and are having the BEST TIME EVER! It’s been a grand adventure and tremendous fun. They are looking forward to many more quarteting years together. They continue to perform at concerts, schools, dinners, Helena Art Walks, Out to Lunch series, and other special occasions, including unique Christmas programs. 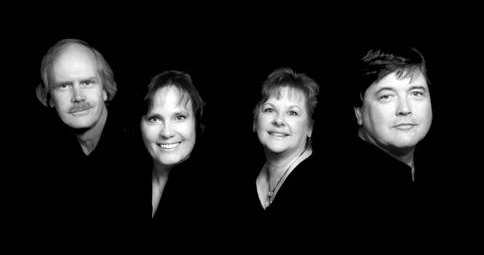 Members are: Alane Dallas (alto), Karen Keith (soprano), Mike Early (bass), and Bob Nelson (tenor). All live and work in Helena, Montana. Instrumentalists- Tom Larson- Bass, Sandy Rolan- Oboe, Jan Van Hook- Flute. So as your day has been filled with joy and wonder, with the fantastic music of CiJ-P1 and CiJ-P2, we’ve finally come to the Winter-slash-Christmas-slash-It’s-Really-Kind-of-a-Holiday-Even-If-You’re-Working concerts from 2010 and 2011. And really, this rounds out nearly ELEVEN HOURS of music from the Helena Chamber Singers, and we truly hope you’ve enjoyed your Christmas in July. It’s the second most wonderful time of the year! You see, in Montana, we sometimes get snow even in the middle of summer, but even if that happens, it’s usually brief and surrounded by blessedly hot summer days that cool off into amazing summer nights. But who cares? It’s July 25th, so it’s time for Christmas in July. As a special gift, there are three parts to this showcase of every single Christmas concert that the Helena Chamber Singers have performed. You should just download the show and enjoy playing completely inappropriate yet totally safe for work music performed by the amazingly talented members of the Helena Chamber Singers. Part 1 includes the Christmas-slash-winter concerts from 2001 – 2005. Enjoy! Because what Broadway compilation would be complete with Sondheim? None. Please enjoy these wonderful songs! In this week’s Rehearsal podcast, we play the songs of Andrew Lloyd Webber that were performed in our June 2005 concert. Enjoy! Kevin is joined by Larry Sheldon, and they spend a bit of time talking about the 2009 spring concert Feel The Spirit. You can hear snippets of most of the music from this concert in this podcast. Enjoy! You can also see the entire list of songs, soloists, guest artists, and other information on the concert history page. In May 2001, the Helena Chamber Singers had their second concert, and Kevin Hamm and Gayle Sheldon recap some of the wonderful pieces performed. This is the first of our summer review pieces because we wanted to remind you of pieces we’ve done in case you wanted to vote for them for our concert in Spring 2013. Enjoy! Our concert this last weekend included several songs from Porgy & Bess. We thought, in case you missed it, that it’d be fun to put that up for you here. Enjoy. If you want to know who is singing what, you can check out the concert list for Folk Fantasia. Not that we were wearing anything special, but we’ve had our final rehearsal outside St. Paul’s and our Spring Concert, Folk Fantasia, is tomorrow. Coleen Smith joins Kevin Hamm as they talk about the music you can hear and a special concert next year that you get to help out with. Enjoy! Once again, Dale joins Kevin in discussing the fantastic music of “Porgy & Bess” that the choir will be performing at our April 28th & 29th concerts. This week, Dale Waniata joins us as we discuss “I Am Not Yours”, a song we are performing at our concerts on April 28th & 29th, 2012. The poem is by Sara Teasdale, an American poet of the early 1900s. It’s our first podcast, and our director, Dr. Steven Michelson, talks with Tenor Kevin Hamm about two of the pieces the choir will be performing later this month. Enjoy some of the behind-the-scenes rehearsing and thinking that goes into our concerts.